We read it so you don’t have to. [the WestConnex Road Traffic Model] forecast future year traffic demands are well in excess of the network’s practical capacity … [The model] shows significant traffic growth between 2015 and 2023 on many north-south arterial roads approaching the CBD which would be considered to be at or very close to their practical daily capacity now and hence would simply not accommodate the levels of increase forecast. The model is predicting that roads will carry more traffic than these roads can actually carry. if the levels of congestion reported by the WRTM were being approached, then the accessibility-economic relationships would influence land use development and hence realise alternative demographic growth outcomes than those that have been input into the model Long before congestion reaches the forecast level, people will change where they work or where they live, which means the model is wrong. volumes should be considered as the volume being demanded of the network under certain demographic growth assumptions and not necessarily the traffic that could be supplied by the network The model is predicting that roads will carry more traffic than these roads can actually carry. The benefits assessment for the project has been based on the WRTM which may tend to overstate the congestion levels in the future base case and hence overstate the congestion-reduction benefits of the project The forecast level of benefits only happens if the roads are more congested than they physically can be. the level of detail provided from the microsimulation model is insufficient to completely understand pinch point effects and queuing patterns and how they influence the results. “detail provided is insufficient” = there is not enough data provided to have confidence in the answer given. most of the key intersections are shown to operate at peak hour LoS of D or better in all years and for all scenarios. Given the forecast increases in traffic demand, particularly associated with ramp entry and exit points, this is difficult to rationalise “difficult to rationalise” = cannot both be true. Either the traffic forecasts are wrong, or the predicted performance of intersections is wrong. queueing on the Wattle Street approach to its intersection with Parramatta Road is likely to block back along Wattle Street and into the westbound exit tunnel portal. The modelling suggests that this queue does not extend back to the tunnel mainline however this cannot be confirmed with the information provided. Furthermore, these queue lengths would be expected to continue to grow beyond the opening year and could very likely extend to the tunnel mainline by 2033. WestConnex will be a traffic jam. Traffic trying to get on/off WestConnex is going to jam up other roads as well. travel time results show some excessively long times between City West Link and Frederick Street with and without the project and these results would appear to be in conflict with the reasonable LoS results for the Wattle Street / Parramatta Road intersection “appear to be in conflict” = Cannot both be true. Either the travel time results are wrong, or the predicted performance of intersections is wrong. They can’t both be right. soon after opening, queues will extend back across the Anzac Bridge and into the Rozelle Interchange. … inbound City West Link traffic will also be affected WestConnex will be a traffic jam. Traffic trying to get on/off WestConnex is going to jam up other roads as well. And this assumes there is a plan for the Rozelle Interchange, which is no longer true. these queues could generate secondary impacts to non-radial movements such as between the Iron Cove Link and the M4-M5 Link to the south of the interchange. WestConnex will be a traffic jam. Traffic trying to get on/off WestConnex is going to jam up other roads as well. And this assumes there is a plan for the Rozelle Interchange, which is no longer true. The travel time comparisons reinforce the consequences of essentially ‘flooding’ the Anzac Bridge with traffic … and impacting the Rozelle Interchange and consequently Victoria Road and the Iron Cove Link inbound WestConnex will be a traffic jam. Traffic trying to get on/off WestConnex is going to jam up other roads as well. And this assumes there is a plan for the Rozelle Interchange, which is no longer true. queues extend from the Anzac Bridge back into the interchange ramps and the ends of the model near Victoria Road. In effect, these queues could, by 2033, be expected to block trips from the Iron Cove bridge intending to access the south via the M4-M45 link. Functionally, one of the key purposes of WestConnex was to connect origins and destinations within the Victoria Road, the M4 and the M5 corridors and the queueing back potentially undermines some of this functionality WestConnex will be a traffic jam. Traffic trying to get on/off WestConnex is going to jam up other roads as well. And this assumes there is a plan for the Rozelle Interchange, which is no longer true. WestConnex is going to make things worse, not better. By 2033, the network is so overly saturated that the benefits of the project are small in absolute terms with many intersections still operating over capacity in both peak hours. The PM peak is worsened compared to without the project and this is expected with the M4-M5 Link essentially feeding more traffic into an area that is already heavily congested, particularly in the PM peak hour where airport demands and outbound peak traffic demands co-inside. WestConnex will be a traffic jam. Traffic trying to get on/off WestConnex is going to jam up other roads as well. WestConnex is going to make things worse, not better. The simulation modelling queue length outputs for the project case show no visually significant reduction in queues compared to the do minimum case. The network is so heavily saturated that it is very difficult to draw any firm conclusions regarding the relative impacts and benefits of the project in this area. The management measures identified in the EIS rely on the proposed ‘Sydney Gateway’ being constructed and no real alternative has been offered in lieu of this. WestConnex will be a traffic jam. Traffic trying to get on/off WestConnex is going to jam up other roads as well. The government has no idea how this is supposed to work. The Sydney Gateway was supposed to be this magic tunnel that would fix everything, and now it’s not happening any time soon. How the intersection of Frederick Street/Parramatta Road/Wattle Street performs with the project and how impacts at this location can be managed? WestConnex will be a traffic jam. Traffic trying to get on/off WestConnex is going to jam up other roads as well. The extent of effects of queuing back from the Sydney CBD into Anzac Bridge and into the proposed Rozelle interchange and what are the consequential impacts on non-CBD movements, and how could they be mitigated? WestConnex will be a traffic jam. Traffic trying to get on/off WestConnex is going to jam up other roads as well. How to reasonably assess the potential impacts and benefits in the St Peters area without implementing other upgrade projects as part of the base case, or further reducing assumed traffic growth. The model assumes that the roads in St Peters are not congested, and is therefore wrong. No public transport modal share impacts on the rail system or bus system, or light rail due to the project have been documented in the EIS; WestConnex may be going to stuff up public transport. No tangible measures have been offered to manage the impacts generated at the Wattle Street/Parramatta Road/Frederick Street intersection or the queue-back impacts from the Anzac Bridge into the proposed Rozelle interchange; WestConnex will be a traffic jam. Traffic trying to get on/off WestConnex is going to jam up other roads as well. There are insufficient details to demonstrate acceptable mitigation of City West Link traffic delays during construction. WestConnex will be a traffic jam. Traffic trying to get on/off WestConnex is going to jam up other roads as well. The representation of apartments, offices (etc.) as a single receptor point increases uncertainty in the assessment as it has potential to underestimate the affected population and the pollutant impact. This is because many receptor points were selected in the centre of an apartment block or complex, rather than at the edge nearest the main road “potential to underestimate” = this is BS. The interpolation used results in implausible changes in pollutant levels across the modelling domain, making the approach challenging to accept, and leading to significant potential errors in the absolute predicted levels. “implausible” = this BS. “challenging to accept” = this is also BS. “significant potential errors” = seriously, this is more BS. The EIS groundwater impact assessment assumes that long – term average groundwater inflows into the tunnels can be limited to less than 1 L/s/km. … the whole assessment rests on an untested assumption. there is a high risk of fracture and a high degree of connection to the overlying alluvium the impact will be rather larger than predicted. It is recommended that the submission be clarified Please redo this BS so it is less BShitty, a comment that could apply to the whole Approval. This just in from Lord Mayor Clover Moore. Every word is true. This is shocking. Despite the massive community response against Stage 3 of WestConnex, including a phenomenal 13,000 submissions in opposition, the NSW Liberal Government just rubberstamped it. In protest, a snap rally is being organised at 12.30pm tomorrow outside the NSW Parliament – will you join our community and stand up against this appalling decision? WestConnex will be a disaster for Sydney – it’s set to increase traffic congestion, make air pollution worse, lock in escalating tolls and create a black hole in our budget. It’s the very opposite of State and City policy to reduce the number of cars coming into our congested city streets. The fact that they slipped out the press release on a Friday afternoon at the end of the school holidays, just after Anzac Day shows they know this is unpopular, they know the community is dead against it, and they desperately want to avoid scrutiny and responsibility. Update: We have been told to expect Lord Mayor Clover Moore to attend tonight’s meeting. 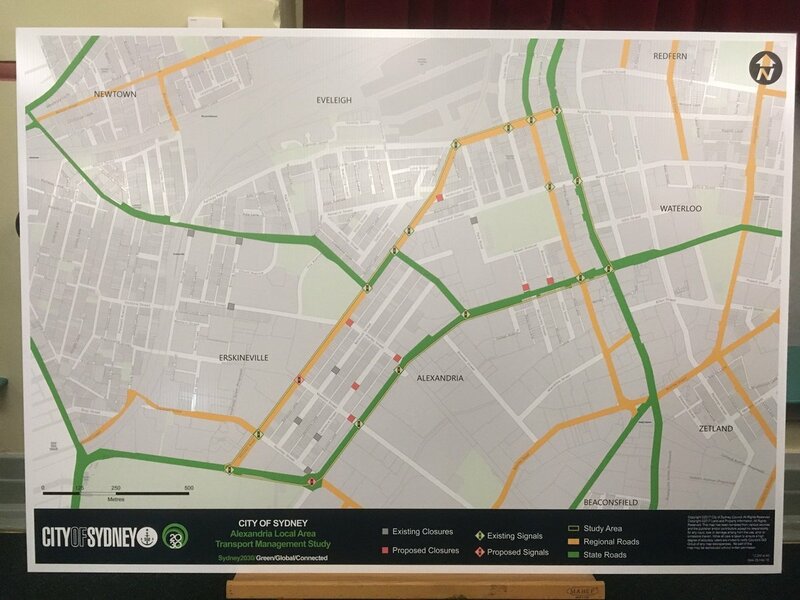 Protecting Local Streets – City of Sydney transport study – Clover Moore to speak, traffic engineers will be present as well. Meeting starts at 7, at the usual venue: Alexandria Town Hall, 73 Garden St.